Start your Secure Online Financing Application! 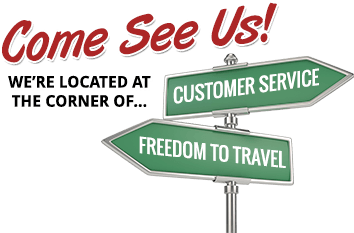 Why Finance Your RV with Liberty RV? Down payments are lower - Although final terms are determined based on your credit profile and the age, type and cost of the RV being purchased, financing through RV lenders usually requires down payments in the 10% range. Finance terms are longer / Monthly payments are lower - Because RV finance specialists know that RVs maintain their value and resale appeal, they tend to offer more attractive terms. In fact, it's not uncommon to find 15-20 year repayment schedules to help you afford the RV of your dreams.